With the exception of his typewriter key arm guards, all of Willeford’s creations are functional. He is also the author of the first book on how to make your own steampunk accessories, “Steampunk Gear, Gadgets, and Gizmos.” But beyond function, what Willeford and other steampunk craftsmen like him value is the narrative thread that pulls steampunk as a movement together. Every chapter in his book includes a piece of fiction at the beginning that explains the use of the item. The arm guards are a way to communicate with the crew on your airship, by sending information back and forth through crystal resonance. And mechanical arms become a fashionable badge of honor for Civil War veterans who have suffered through amputation. Willeford’s own character, Lord Featherstone, is the “evil genius” behind the creations of Brute Force Studios. Sometimes, the gadgets create the characters for these steampunk mad men. Other times, the characters are the foundation for the gadgets. Either way, limitless creativity is intrinsic to both. For Joey Marsocci, his fantastical creations led to his steampunk character, Dr. Grymm. Marsocci, who grew up fascinated by “Frankenstein” and “20,000 Leagues Under the Sea,” used his training from the California Institute of the Arts to lead art direction on the 20,000 Leagues attraction at Tokyo Disneyland. Then, he began making machines that were based on the historical brains of Edgar Allan Poe and Amelia Earhart in Dr. Grymm’s Laboratories. Marsocci is also what he calls a “steampunk artist liaison” – if he can’t work on a project, he sends commissions and recommendations out to his personal network of artists all over the world. 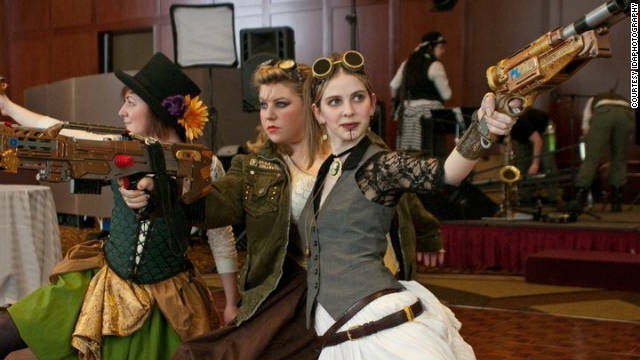 This far-reaching steampunk community helps “build a world that didn’t happen into reality” for the subculture, he said. It is a network that is kind to veterans and newcomers alike. A relative newcomer to steampunk, Geoffrey Smith was first exposed to it at ConnectiCon in 2010, and it inspired him to start crafting and selling medals, hardware guns and modified Nerf guns through his shop, Thee-Gartisan Works. But what Smith enjoys most of all is the repurposing of antique items in crafting his hardware guns, which means using lamp parts, bed post finials, plumbing pipe and floral misters to make elegant derringers, rifles, pistols and carbines. Steampunk clockmaker and owner of Klockwerks Roger Wood can relate to that love of discovering the magic in creating something new out of an old object. He builds extravagant clocks using repurposed antiques and spends half his time tracking down the inspiring pieces that he will use to craft one-of-a-kind clocks. Long before he knew the term steampunk, Wood was creating his Jules Verne-inspired pieces. Besides a love for steampunk before they knew the term, all of these men have a strong common thread: They all know Bruce Rosenbaum, and they’ve all worked together to exhibit their steampunk creations. In the steampunk community, Rosenbaum is known for his work with steampunk exhibitions like Mobilis in Mobili, Charles River Museum’s Steampunk Form and Function and the Mark Twain Houses’ Steampunk Bizarre (the latter developed by Dr. Grymm). But Rosenbaum is also known for his company, ModVic, which restores Victorian homes, steampunks the interior and combines an antique aesthetic with modern convenience. After remodeling their own home, ModVic was soon created to help others turn their Victorian homes into magnificent, functional sculptures of steampunk design. The couple also repurposes salvage and antique items to create steampunk interiors for homeowners and businesses, in addition to disguising modern technology in antique casing. “People love this because you have these beautiful objects that don’t have a function anymore, but now we’ve given them new life and purpose, so people love seeing those opposites coming together and making something new,” he said. Trends in steampunk design may come and go, but the aesthetic and ideas will never be abandoned by the subculture that created them. Steampunk is a supportive community for artists, authors and anyone with a creative streak. “These are the people who feel like they have found their home,” Willeford said. Isn't this article a little late out of the gate? As with any of the other realms of creative beauty, those who are the modern DaVinci's who are both master artists and master craftspersons make functional art, Jake Von Slatt is IMhO representative of that and Bruce Rosenbaum as well. Their pieces with a few exceptions function. Those who are wonderful artists and can dream fantastic designs but do not also have the inner master craftsperson to draw from share their dreams as non functional art. This in no way detracts from the art or the artist, the art can still bring joy to people. Largely though, we have been taught to color inside the lines, many employers want us to only be creative in the way they tell us to be, some not at all, it all gets a bit much. Imagining that there might be some such thing as an Heterodyne Aether Wave Induction Drive while we look at a mass of beautifully assembled copper and brass married to odd recycled gauges and gears backed up by a silvered sail and a picture of a Zeppelin in space is indeed fun and allows the mind to escape from the world of cubicles and traffic jams at least for a little while. I have a great domain name for sale which I most likely will use: SteampunksR.us if anyone is interested, look it up! This brings to mind the PC games Syberia, Myst, Riven, and possibly Curious Village. The first movie (including book series) I thought of was Lemony Snicket, although Hugo may also be included (I have yet to see it). Love it. Lynch's version of Dune was so far ahead of its time, as was Wild Wild West. From now on will look at old machinery and wonder how it could be adapted. Thought I'd give a shout out to a great steampunky show that barely got off the ground....Legend, with Richard Dean Anderson and John De Lancie. My husband and I love the creativity as well as the recycle-ability of well done steampunk! Thanks for the article. Or the much-better Adventures of Brisco County Jr. There were many great steampunk shows that you may not have even realized. The Wild Wild West series with Robert Conrad, The Doctor Who series, Sherlock Holmes, The League of Extraordinary Gentlemen, Any adventure by Jules Verne. Its like we've broken through to a parallel world where all of the futuristic Victorian devices are developed and used for daily life. The people who say "what's the point" haven't got a creative gene in their bodies. Sometimes, things don't need a point. Sometimes the point isn't clear until you get there. Sometimes, you find that the point of something is that thing itself. You just never know until you try. But there is one thing you can always be sure of: if you try something, if you do something, you will learn. You may learn that what you tried or did wasn't so good, but that's a good thing to learn too. This stuff makes me think of what technology and live would have been like in the U.S. without the influence of countless immigrants, minorities and foreigners like Tesla, Lilienfeld, Von Braun, Carver, Faraday, Castillo, Bosch, Marconi, Cervera-Baviera, Fermi, Fleming, Hashimoto, Yamasaki, Benz, Diesel, Blair, Boykin, Jones, Crosthwait, Guillaume, Sikorsky, Leowi, Alferov, Biro, Boneh, Cohen, Eisler and many, many others; in otherwords, a pure WASP world. Makes me think about what the world may have been like if any more than a few rare oddballs throughout history cared about technology and invention. Also, weird that nearly your entire list consists of white scientists and engineers or minorities in the philosophies and arts. Doesn't really push your point very far. Are you serious? This steampunk stuff SHOUTS Tesla so much more than it does Edison, Bell or the like. The negative comments are truly the best part of this article! "What's the point," asks one typical troll. Maybe it's that part about getting off the couch, putting down your beer and turning off the football game, and doing something with other, actual, real people (playing Farmville and Mafia Wars on Facebook doesn't count) and spending time with people with similar interests. Kind of crazy, right? I do admire the negativity from people who don't get it. It's not something they are interested in, so it must be strange and therefore they must pan it. I guess I look at people who congregate once a week on hard, uncomfortable wood benches to hear someone say they are going to burn for eternity as even stranger behavior. Or those guys who get tumescent over other guys who earn millions of dollars for running around a grassy field with a little ball. And most of all, those people who make fun of other people but don't have any activities or interests of their own. Our benches are cushioned just for your information. So because I like to interact with people about football and sports makes me a beer swilliing loser? If people want to put their energy in steampunk, great. If they love to read, great. If you're a nature nut, fantastic. But responding to criticism and stereotyping with the same sort of behavior is kinda silly and hypocritical. Just because a lot of people like something doesn't make you a moron for liking it too. Cute and interesting. But what's the point? What's the point of any speculative fiction? It's fun to imagine different worlds. I would have loved this "movement" if people were actually tinkering and making functional gadgets more than just a bunch of costumes. I've only been able to find a handful of ppl who actually do that. It's sad really. If you wanna make fancy costumes that's fine but how is that anything but just theatrical costuming? Look into the "maker movement." The "Maker Movement" people have quite an affinity with the "Steam Punk" crowd. But, as you suggest, they like to make things that actually work. Steampunk – taking modern technology and putting in a setting where it does not belong, i.e. Victorian England, or the wild west (Wild Wild West show and movie.) Jules Verne I would not say was steampunk. He was a visionary, didn't take future technology and write about it in his era. He created the future. I think the new Sherlock Holmes movies are considered steampunk but not sure. Totally, as well as 'Wild Wild West' (with Will Smith), The Prestige, Van Helsing, The Golden Compass, and a lot of Hayao Miyazaki's films. The Lemony Snicket movie also has some components. While popular with Steampunk afficianados, the Sherlock Holmes movies actually take place in victorian england, not an alternate reality, so I wouldn't personally consider them SP. However, they do take some liberties with the technology of the time, so it appeals. I have always disagreed with the characterization of Jules Verne as "Steam Punk" too. Mr. Verne looked forward with what he had. He looked forward, not back. I love the look, but what's the end game on sustainability. We have no more time to decorate with shinny objects that don't create more energy than it took to make them. Sorry to pop your bubble. Check out real sustainable art on youtube under dragon oven. Just glue some gears on it and call it steampunk. This video talks about what is steampunk and what is a not. Or the flying train from Back to the Future 3, is a good example as well. How come I can sound of on something trivial but I can't sound off on taxes? Censorship perhaps? Steampunk: When Goths Discovered Brown! The advantage of steampunk "inventions" is that they don't need to work. They are art projects, not real gadgets. Even the truly inventive ones are mashups– gadgets other people invented adorned with pseudo-Victorian trimmings that are tacked on for purely aesthetic reasons. Clogs what? Hogs what? Usurps what? Regurgitates what? Someone so in love with his own words should do a better job of explaining his point of view rather than simply spewing it in a way that leaves those guessing who do not share his cranial cavity. When last I looked, pop culture was not a broom closet. Space is not limited. You are not required to enjoy it. A world that adhered to what you deem worthy of merit would be a bleak landscape of strip malls, fast food, and Michael Bay regurgitations. Good invertors borrow, great inventors steal! GRS62, the most obvious example of a steampunk movie is Wild Wild West (and yes, even steampunks know that movie sucked ... but the gadgetry was cool). My favorite television example was "The Secret Adventures of Jules Verne" that (sadly) lasted only one season. I once looked at a picture of a couple of people and a contraption which was labeled as "steampunk", and I immediately knew what it meant and could relate. Some people just get it. Some dont. Not every niche is for everyone or meant to be understood by all. BTW, the adult toy thing sounds kind of cool. I wonder what some steampunk battery operated adult toys might look like? After reading this entire article I still have no clue as to what or who Steampunk is. Good to know I'm not the only one who thought this! Steampunk is a what, not a who. It is an alternate Science-Fiction and/or Fantasy universe where steam power became the prevalent source of energy. It is usually depicted in an alternate version of Victorian Britain and the US Wild West. Thanks MrBo- Great, simple explanation without the sarcasm of some posts. I appreciate it and now I've learned something. CNN – You should have done it right in the first place. Imagine all the technological wonders we have today, only done in 18th century technology. Like a person above put it, similar to the gadgets they had in the movie Wild Wild West. The easiest way to explain: the future imagined in the Victorian era as an alternate reality. Yeah, this article is a bit limited in its content. But, Google can certainly turn up some more in-depth information for you.